As the troubles of a stranded Russian Mars probe show, humanity has not exactly mastered spaceflight despite more than 50 years of practice. Russia's Phobos-Grunt spacecraft got stuck in Earth orbit shortly after its Nov. 8 launch, and hopes of salvaging the unmanned probe's mission to the Martian moon Phobos appear all but lost. Such mishaps have been distressingly common lately: Nearly 10 percent of all space missions launched in the last year have failed. All of which goes to show that spaceflight remains a difficult proposition, experts say, even 54 years after our species lofted its first object — the Soviet satellite Sputnik I — into orbit. "Accelerating payloads to orbital velocity of 17,500 miles per hour in just a few minutes requires controlling a very high amount of explosive energy," said space policy expert John Logsdon, professor emeritus at George Washington University. Developing the systems to harness and direct that energy is tough, Logsdon added, as is devising spacecraft that can survive the bumpy blastoff and work in the harsh environment of space. Since Dec. 5, 2010, a total of 74 space missions have lifted off the pad. Some have sent scientific probes racing toward Jupiter or the moon; others have launched satellites or astronauts to Earth orbit. Counting Phobos-Grunt, seven of those 74 missions have suffered major failures. The picture gets even grimmer if you include Japan's unmanned Akatsuki probe, which sailed past Venus on Dec. 6 instead of entering into orbit around the hellishly hot planet (Akatsuki launched in May 2010). Five of the recent mission failures were Russian. In addition to Phobos-Grunt, three separate satellite launches went bad, and the unmanned Progress 44 supply ship crashed while hauling a bellyful of cargo to the International Space Station. These problems could point to systemic issues within the Russian spaceflight program, some experts say. 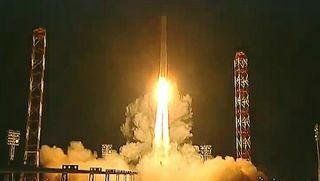 "These and other failures point to serious follow-through quality control failures long expected and of concern to Russian space analysts," Charles Vick, a senior technical and policy analyst at Globalsecurity.org, told SPACE.com after the Progress 44 mishap. The other two big setbacks affected China and the United States. A Chinese Long March rocket failed to loft an experimental satellite to orbit in August. And in March, NASA's $424 million Glory climate satellite crashed into the Pacific Ocean after the nose-cone fairing on its Taurus XL rocket failed to open as planned. The occasional failure is to be expected because spaceflight is so challenging, experts say. "There's a lot of energy exchange required," said Richard Cook of NASA's Jet Propulsion Laboratory in Pasadena, Calif., deputy project manager of NASA's $2.5 billion Mars Science Laboratory (MSL) mission. "We're taking a 10,000-pound spacecraft, and we're putting it on top of a [1.2 million-pound] launch vehicle, which is all required to get it into orbit." "Physics and gravity are working against us big-time here, and because of that it doesn't take a very big mistake," Cook said of MSL's launch. "You're right on the tipping point, and things [can] very rapidly go bad." "As long as we use chemical propulsion to get payloads to orbit, there will be launch failures," he said. However, the number of failures over the past year has been abnormally high. Many rockets have success records around 97 or 98 percent, Logsdon said. And the space shuttle, which NASA retired in July after 30 years of service, failed just twice in 135 missions, putting its reliability at about 98.5 percent (though those two failures tragically resulted in the deaths of 14 astronauts). "So it is possible to launch with very high reliability," Logsdon said. "It seems as if we are having a particularly bad year; most years do not have as many failed missions as 2011." The year is not done yet, of course, and several more high-profile missions are on the docket. One of these is MSL. While lofting a satellite to Earth orbit can be tough, sending a robotic explorer to another world is far more challenging still. MSL will be the 40th mission to Mars; 60 percent of the previous 39 failed to achieve their main mission goals. Curiosity will have to survive liftoff, an 8 1/2-month cruise through deep space and a novel and perhaps harrowing landing on Mars, in which a hovering, rocket-powered sky crane will lower the 1-ton rover on cables. And after that, Curiosity will brave the Red Planet's high radiation and fluctuating temperatures for two Earth years or more. "It's the difficulty of the long series of things that have to work, as well as the environment," Cook told SPACE.com. "I think those are the two main challenges." Cook said the MSL team has done all it can to prepare for these challenges, and mission personnel are confident that Curiosity will be a success, as other recent NASA Mars efforts have been. But, as with any space mission, there are no guarantees. "We feel like we've had a really good test campaign," Cook said. "But there is an element of it that you really can't control — Mars — and so it's never a slam dunk." Getting better in the future? Cook said he envisions scientific spaceflight getting more reliable as the years roll by and engineers get more and more experience under their belts. But it probably won't be routine for quite some time, Cook added, because we just don't do space exploration missions very often. For comparison, he brought up aviation, which had a lot of accidents back in the 1920s and 1930s. The aviation industry got safer quickly, because there was strong economic pressure to make passenger air travel work on a large scale, he said. "I think we're going in that direction, but we're still in the equivalent of the early days," Cook said. "And I don't think the slope is as fast as it was in the aviation industry, just because there's not enough pressure to do it often enough to commoditize it." Another factor also makes it tough for scientific spaceflight to be routine, according to Cook. We don't want to answer the same questions over and over again, so each mission tends to be different, and more ambitious, than the last. "The science questions become a lot harder," Cook said. "Now we have to go find out if Mars was habitable in the past. That means that the science payload's got to be a lot bigger, and it's got to be a lot more sophisticated. You kind of push forward in every axis."